The health of our brain and our ability to function at our best is highly dependent on the fuel in which we provide it, which of course comes in the form of food. Our brain uses the highest percentage of calories per bodyweight than any other organ in our body, making a proper diet that much more important. 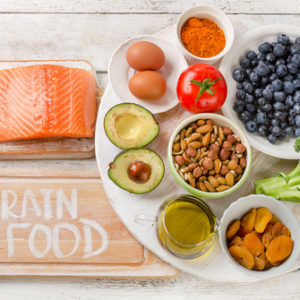 When it comes to the brain, you not only have to supply it with the nutrients it needs just to operate, but you also have to worry about other things like inflammation, stress and other factors that are going to affect it as well. These potential issues can also be resolved through a proper diet, however you need to know where to start of course. If you are one of the many people who avoid whole eggs because of the high cholesterol content of the egg yolk, you may want to reconsider that decision. This is because whole eggs contain a chemical called choline, which breaks down another called bethane. The breakdown of the second chemical is involved in the production of hormones which make us happy, so eating whole eggs will in fact improve your mood! Another thing to note here is that the dietary cholesterol in eggs doesn’t translate to blood cholesterol as commonly thought. Whole eggs in fact do the reverse, in that they raise healthy levels of cholesterol. Turmeric is a powerful supplement that has been used for thousands of years for its multiple health benefits. These all revolve around the ability of turmeric to supply the body with anti-inflammatory ingredients, mainly that of curcumin. Inflammation is a major issue which turmeric can help to fight off through supplementation. Inflammation affects the brain’s ability to function in the short term, and is also the cause of many diseases which affect our bodies. Walnuts are a very nutrient dense food, providing us with plenty of healthy fats, vitamins, minerals and antioxidants which help to maintain optimal brain health. Antioxidants help to improve mental alertness, the ability to retain information, and good overall cognitive ability. 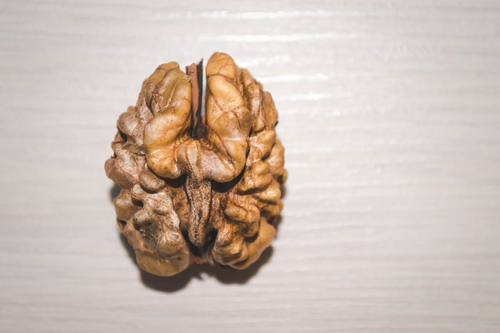 Walnuts are also of interest in the fight against Alzherimer’s disease because of their high content of vitamin E. This is a food you want to be eating more of for not only the benefits to your brain, but body a s a whole. Avocados are a weird looking fruit that isn’t exactly too inviting for people unfamiliar with them. They are houses by a dark, wrinkly looking outer skin that looks pretty gross if not rotten. Inside however it contains one of the healthiest fruits out there due to how rich it is in healthy fats. Along with these fats which help to regulate hormones and blood sugar levels, avocados contain vitamin K and folate. These two nutrients are essential in the prevention of blood clots in the brain, which help to maintain proper cognitive functioning as well as preventing serious health issues like strokes. Broccoli is another food loaded with choline and vitamin K, which will help keep you sharp and prevent cognitive decline. It also contains a very high amount of vitamin C, which is a very powerful antioxidant itself. Antioxidants help to prevent the occurrence of oxidation within the body, which is the cause of inflammation, stress and other negative health consequences that comes as a result. Broccoli is one of the best foods you can eat for a better functioning brain, and one that is good for your body in general. Dark chocolate is great for brain health for two major reasons. First it contains plenty of antioxidants in the form of flavonols, which help to protect the brain and the blood vessels within in from various forms of damage resulting from free radicals. Second, it contains chemicals which stimulate the production of endorphins in the brain. This is how chocolate leads to feelings of happiness and elation, which really does act similarly to an anti-depressant. Make sure to buy the dark chocolate varieties only, preferably ones that have 70% cocoa or more. The higher percentage of cocoa solids in the chocolate, the more rich in these flavonols the chocolate will be. This in turn means that the darker the chocolate, the better for your health it is.